(White Plains, NY) The Music Conservatory of Westchester will ring in the new year with a concert by the Golden Williams Duo on Thursday, January 3rd at 7:30pm in the community music school’s Recital Hall. 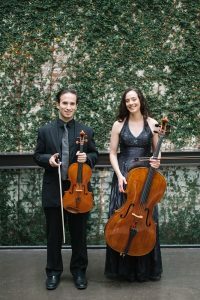 Cellist and Conservatory faculty member Diana Golden, and Assistant Principal Violist of the Hudson Valley Philharmonic Gregory K. Williams, will perform a program of duos for cello and viola. American Haiku by Paul Wiancko (b. 1983) was commissioned by Ayane Kozasa and premiered in 2014. A richly-textured duo that incorporates Appalachian fiddling, percussive patterns and Japanese folk-inspired melodies, the piece explores Ayane’s background as a Japanese artist growing up in the United States as well as Paul’s Japanese-American heritage. This entry was posted in Press Releases and tagged cello, classical, concert, duets, Golden Williams Duo, music, music conservatory of westchester, viola. Bookmark the permalink.